The awards are presented each year by the organizers of the Intersolar, ees, Power2Drive and EM-Power exhibition and conference series in cooperation with international industry associations. Altogether, three awards are awarded in four different main categories. The The smarter E AWARD is given in two categories. The Smart Renewable Energy category honors outstanding, innovative business models and pioneering solutions in the area of sector coupling, while the Outstanding Projects category recognizes realized projects undertaken in the areas of solar, storage, energy management and clean transportation. The Intersolar AWARD honors entries for innovative technical products and solutions around the topic of photovoltaics. Next to the Intersolar AWARD category Photovoltaics, the Intersolar AWARD honors individuals in North America who have demonstrated an outstanding commitment to supporting the development of renewable energy with its special award category Champion of Change. 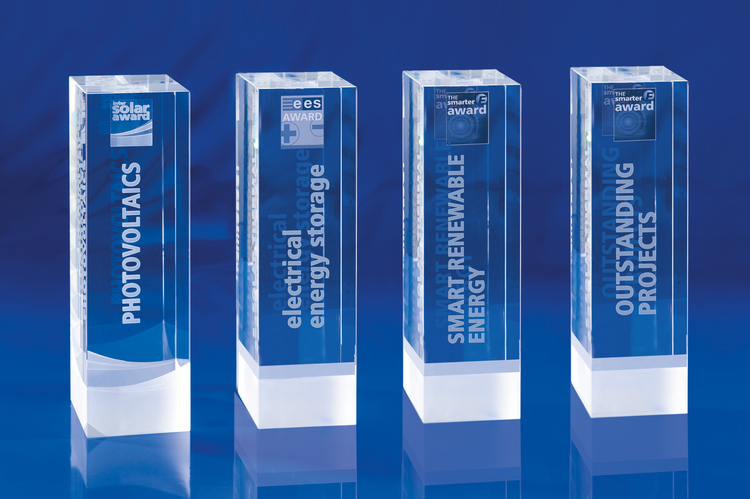 With the category Electrical Energy Storage, the ees AWARD pays tribute to pioneering products and solutions for stationary and mobile electrical energy storage systems. Each year, the presentation of the AWARD winners takes place at the AWARD Ceremony as part of the The smarter E Europe in Munich.